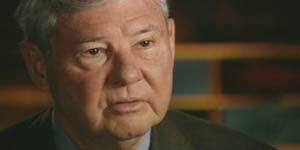 Sen. Bob Graham (D-Fla., 1987-2005) chaired the Senate Select Committee on Intelligence in 2002, as the Congress voted on the Iraq War Resolution. it was Graham and his colleagues on the committee that ordered George Tenet to produce the now-infamous National Intelligence Estimate on Iraq's weapons of mass destruction program. In this interview, Graham discusses his experiences and perspective during the months leading up to the invasion of Iraq, including how he first learned the administration was readying for war, the inadequacies of the CIA's intelligence analysis and the administration's politicization of the intelligence process. This is an edited transcript of an interview conducted on Jan 31, 2006. I went on the [Senate Select Committee on Intelligence] in 1993, and that's where I first was exposed to George. He was the deputy director [of the CIA] at that time, and then subsequently became the director of the CIA. He had come out of a congressional background. He'd been the staff director of the Senate Intelligence Committee, so he was generally well-known and well-liked and respected. His politics -- do you have any sense of what they are? I don't know what his partisan politics are. He was the staff director of the Senate Intelligence Committee while the Democrats were in control, so that may indicate that he's a registered Democrat; I do not know that. I was never aware until the events surrounding 9/11 that he had any degree of partisan orientation. What was it that revealed itself then? Well, I felt that he had become the messenger of what the administration wanted to hear, rather than the fundamental purpose of intelligence, which is to speak truth to power -- to tell the administration what is the best information our clandestine services have been able to gather -- so that the president and his decision makers can make better judgments on behalf of the United States' people. I don't know what that says. It could say that maybe people had heard Director Tenet make similar statements and had not followed through, so it's sort of like the crying-wolf syndrome. It may have been that he was a good megaphone, but he wasn't the kind of manager who could demand of those who were subservient to him that they follow the lead that he had established. It was in a pretty big mess, largely because it had churned out several directors, ... and I think the agency just was rudderless. [The] first responsibility Tenet had was to stabilize the ship and then begin to figure out what port he wanted to go to. When [did you become] ... aware that Iraq was topic A or B inside the foreign policy side of this administration? They must have known at that time that both philosophically and at a personal level, Saddam Hussein and Osama bin Laden were adversaries. The idea that they had collaborated in 9/11 was absurd. How did you hear about it, that they were headed in this direction in February of 2002? Well, I heard about it during a briefing at Central Command [CENTCOM], which is located in Tampa, Fla., on the Afghanistan war. The briefing was very positive. Things were going well; victory appeared to be close at hand. Then I was told in a private meeting that no, that wasn't the case; that in fact, we were beginning to recede from the war in Afghanistan precisely to get ready for Iraq. The general said, "Senator, I would like to speak with you privately." We went into his room, and he proceeded to tell me that they weren't fighting a war in Afghanistan; that they were, in fact, beginning to redeploy assets. He particularly mentioned special operations personnel and the Predator unmanned aircraft as examples of assets that were being redeployed from Afghanistan to get ready for Iraq. He then laid out what he thought the strategy should be for victory in the war on terror: Finish the job in Afghanistan; move to other areas that had large numbers of cells of Al Qaeda -- Somalia, Yemen being number one and number two. He went on to say that Iraq was a special case, that our intelligence there was very poor, and that the Europeans knew more about Saddam Hussein's weapons of mass destruction than we did. The head of CENTCOM, a four-star general, is telling you this information. How do you react? I was stunned, because I believed the president when he had said shortly after 9/11 that our strategy was going to be to identify, engage and destroy all terrorists of global reach. I thought that was the right strategy, a clear definition of the mission; that's what we should be following. We should first eradicate those who had just killed 3,000 Americans; then we should go after groups which had killed Americans previously -- particularly Hezbollah -- and had the capability of killing more Americans. That would have been a strategy which would have changed the world today, but instead, we were distracted into the war in Iraq on false pretenses, and Hezbollah, Hamas, Al Qaeda are all more serious adversaries today than they were on Sept. 11. ... Why do you think he told you this? I think he told me this because he wanted to talk to somebody who he thought might have some ability to reverse the policies that he saw taking place. Did he express a level of real frustration? Was he angry? We go to Afghanistan [in 2001] with a handful of CIA agents. ... [T]hey spent $6 million with the Northern Alliance, and they managed to capture Kabul. They got some special forces guys in, they dropped some bombs to be sure, [and with] few casualties, [they] take over the country. ... [How did you feel about our performance there]? Well, it was the culmination. Much of the United States' diplomatic and security infrastructure left Afghanistan when the Taliban took over. The CIA was an exception to that. They kept a continued presence in Afghanistan, particularly maintaining a relationship with these tribal leaders called the Northern Alliance, so that when 9/11 came and we needed to have some foot soldiers quickly on the ground who knew the territory, they were there. We didn't have very many Americans in Afghanistan until the end of 2001 because we were relying on those indigenous forces. It also gave us the opportunity to leverage what was our greatest capability, which was aerial bombardment. In World War II, it is said that it took 3,000 sorties -- that's an individual aircraft -- to successfully annihilate one target. In Afghanistan, one sortie was annihilating 10 targets. The sophisticated smart bombs were part of it; the use of the Predator, which was able to paint the target very effectively, was another part. [The United States' war in Afghanistan] was probably the best example of aerial warfare in the history of warfare. Did it give you some confidence that the immediate future of the war on terror was probably going to tend in the positive direction? Yes. I felt, and I believe until today, that had we stayed in Afghanistan, we could have annihilated Al Qaeda. We had Osama bin Laden surrounded in Tora Bora. We could have captured him. A CIA agent told me: "We don't know Osama bin Laden's address in Tora Bora, but we know a ZIP code." But we made the decision not to put U.S. forces into that area that would have assured a strong perimeter. ... [After you hear from Franks about our plans to go into Iraq], then what? Well, the next big chapter in my involvement in this begins in the late summer of 2002. We had a meeting of the Senate Intelligence Committee, a closed meeting with Director Tenet, and several of us ask him as he was presenting the case for weapons of mass destruction in Iraq, "What did the National Intelligence Estimate say about this issue?" The NIE is the highest level of intelligence product of our community. It represents not one agency, but all of the agencies. It encourages dissent, conditions, nuances, so that the reader can see, "Is this 100-0 confidence, or is it 45-55 confidence?" The answer that we got from Director Tenet is: "We've never done a National Intelligence Estimate on Iraq, including its weapons of mass destruction." Stunning. We do these on almost every significant activity -- much less significant than getting ready to go to war. ... We were flying blind. I was stunned. So we immediately utilized congressional authority. We said, "We want to have a national intelligence assessment." Tenet was reticent to do that. He said: "We're doing a lot of other things. Our staff is stretched thin." We said: "We don't care. This is the most important decision that we as members of Congress and that the people of America are likely to make in the foreseeable future. We want to have the best understanding of what it is we're about to get involved with." He refused to do a report on the military or occupation phase, but reluctantly agreed to do a National Intelligence Estimate on the weapons of mass destruction. But that September of 2002 was the turning point in my, and I think many other members' of Congress, attitude towards Tenet and the credibility of the information and analysis that was coming from our intelligence community. What did you think then of him? Well, I thought that this wasn't a man who was strong enough to stand up to the president of the United States and say: "Mr. President, you are about to make a very serious mistake, and here are the reasons. Here's what we know, here's what we don't know about the situation in Iraq, and it does not warrant us leaving a victory which is imminent in Afghanistan, and attainable in Afghanistan, to start a war in an environment in which we are largely ignorant." Did you [think] that a lot of the information was being "stovepiped" up? Yeah. ... After this first encounter over the fact that there had not been a national intelligence assessment, we then demand one. About three weeks later we get one. One of the surprising things about it was, it was of a very high production level: graphs, photographs in color. It was an advocacy piece which clearly had been under development before we asked for it. It had a strong tilt toward [the notion that] there were weapons of mass destruction, [yet] there were a lot of questions. For instance, the Department of Energy said, "We don't think these tubes that have been represented as the beginning of a centrifuge are appropriate to make a centrifuge." That was in that NIE. There were other places where doubts were raised. Well, let's distinguish between two stages. The first stage was the classified version, which was tilted towards weapons of mass destruction but contained a number of areas of disagreement with that conclusion. We asked that that classified version be scrubbed; that is, any security-related information be redacted and then the rest of it be made available to the American people. Well, what we got three days later was not a redacted version of the original classified report but a wholly new report, which had eliminated all of the conditions and doubts and was a full-scale argument for weapons of mass destruction: imminent threat; we don't get Saddam Hussein now, you're responsible for putting the American people at risk. I was incensed at that point that the American people were being told one thing, and we, in a classified situation, [who] were prohibited from saying anything about it, were being told a significantly different assessment of how sure we were of Saddam Hussein's capabilities, and particularly his intentions. Well, The Washington Post reported subsequent to all of this that in the late spring of 2002, the White House had called down a number of CIA professionals and told them that they wanted a document which could be used to convince the American people that the threat from Iraq was sufficiently serious that that should be our first priority. So beginning in April or May, the CIA started to put together such a document. ... That was what we got as the public version of their conditional, nuanced-with-dissent classified version. I accepted that. There was not any particular dissent about the fact that Saddam Hussein had some capability, [that] he was using that capability for civilian purposes, and that he might convert it to use it for a military purpose. When you hear later that a lot of this information, or a lot of the information that Secretary of State [Colin] Powell uses when he speaks to the United Nations, comes from this guy, [Iraqi defector] Curveball, what did you make of that? The idea that 500 tons of yellowcake [enriched uranium] had found its way from Niger? When you watch Colin Powell before the United Nations [on Feb. 5, 2003, making his case that Saddam Hussein had weapons of mass destruction], ... what [was] the effect on you? ... I was looking to Gen. Powell to be the last line of defense in this administration against the acceptance of this very shoddy information as the basis for going to war. When I saw him buy into this information -- some of which, like the Niger-to-Iraq yellowcake, I knew was not credible -- I was very surprised that he would do so, and I was satisfied that that meant that we were going to go to war. There was nobody else between rolling the tanks and the desire of the administration. There are two other things that happened before that. The president says the famous 16 words in the State of the Union speech. You're sitting in the chamber; what think you? It was consistent with the pattern of making representations. As you know, he was very clever. The way it was worded was, "We have information from the British that yellowcake is going from Niger to Iraq [sic]," so that he had a degree of deniability that he was placing his reputation behind that statement. Editor's note: The president's exact phrasing was, "The British government has learned that Saddam Hussein recently sought significant quantities of uranium from Africa." But for the vast majority, including the public and members of Congress, they didn't hear that first phrase. They heard the hammer that again, more evidence that Saddam Hussein is putting himself in a position to launch a nuclear attack against the United States. And when it appears in a speech in January, what does that tell you about Tenet, about the CIA? It says that whoever had the president's ear in January was not a person who was listening to and relying on the best evidence that the United States government had. So when it all starts to come undone in the summer [of 2003], ... David Kay [then-head of the Iraq Survey Group (ISG)] has gone over [to Iraq]. He calls Tenet; he says, "I'm not finding anything." What are you thinking? I'm thinking that we had made one of the most serious security mistakes in the history of the United States; that we had a clear vision and mission in September of 2001, [and] had we followed it, a whole series of things would not have happened.